Russia is actively developing an unmanned sixth generation aircraft, former Commander-in-Chief of the Russian Air Force, Army General Pyotr Deynekin told RIA Novosti in an interview. He admitted that work on the sixth generation long-range assault jet is in “active phase” and “most probably” the aircraft will be unmanned. While some NATO member countries are planning to ‘forego’ development of a fifth generation fighter jet, buying American F-35’s instead and developing a sixth generation aircraft from scratch, Russia has no possibility to economize in that way, he said. “We must do this serious undertaking on our own, so jumping over a [aircraft development] generation is hardly possible,” Deynekin told the news agency. The former commander refused to compare the combat characteristics of the PAK-FA jet, the American F-22 Raptor and the Chinese J-20, fifth generation jet in development.“Only real practice can expose these aircrafts strengths and weaknesses,” he said. 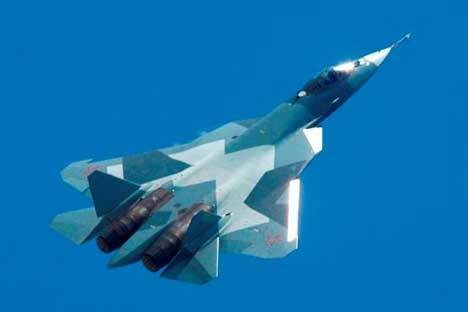 At the same time Deynekin mentioned that in a real combat situation, the PAK-FA would make use of all the stealth equipment on board, making the aircraft undetectable by enemy radars. Still, the general admitted, making an absolutely undetectable aircraft appears to be an impossible task. Deynekin also said that in his view the super-manoeuvrability of the PAK-FA is a big plus as despite advanced capabilities of modern air-to-air missiles, traditional ‘dog-fights’ will still be an option in the future. Therefore an ace pilot will need reliable technology on board and perfect flying skills. The retired general was of the opinion that arming the PAK-FA with 400-kilometre range air-to-air missiles was excess weaponry more suitable for a tactical bomber rather than a fighter jet. Pyotr Deynekin particularly stressed that Russian military thinking does not imply intent of aggressive action on foreign territory, but takes into consideration the size of the Russian Federation where the long-range capabilities of the PAK-FA are an absolute necessity. In spite of the fact that future wars would be a testing ground for new kinds of air assault, the military goals of combatants won’t just be achieved by the Air Force, Deynekin acknowledged. Earlier this month Russia’s possibly most awarded test pilot, Sergey Bogdan, who initially got the PAK-FA airborne, said that a new generation of fighter aircraft could not be expected soon. “One would think that technology is moving forward fast but it has taken 35 years to get from the fourth generation fighter jet to the fifth generation. I believe the next generation fighter will evolve no earlier than in 15 years,” said Bogdan, who is busy preparing an air display of several PAK-FA jets for MAKS-2013. “Pilot-in-the-loop aircrafts will last for a long period of time,” Bogdan predicted. According to American experts, a sixth generation fighter jet would have to display extreme stealth, multimode fighting capabilities, the ability to destroy any kind of target in all flying regimes, from subsonic to up to 5 Mach, – about 6,000 kilometres per hour - possible fuselage self-healing potential, combined with ‘morphing’ and smart skins capabilities. The 6G aircraft is expected to boast extremely far-reaching sensors that would give a highly detailed picture of the battlefield, where every highly networked 6G aircraft would be a part of a bigger network. The most enthusiastic observers believe that one day such aircraft will be armed with ‘directed energy’ weapons. In the US the sixth generation fighter jet program is generally dubbed the Next Generation Tactical Aircraft (Next Generation TACAIR) and is not scheduled to enter service anytime earlier than in 2030.